The IBC Network Foundation honored to be a partner with the Metastatic Breast Cancer Project. The MBC project is led by Dr. Nikhil Wagle, MD, a breast cancer oncologist and metastatic breast cancer researcher and directed by Corrie Painter, PhD, a cancer researcher, cancer patient and patient advocate. Recently an update of the progress of this project was giving at the American Society for Clinical Oncology (ASCO) Annual meeting, where it was extremely well received by both the oncology community as well as the press. In this post our readers can view the poster presented as well as a more detailed slidedeck with an update on the project. We know that our success to date is because of the combined effort by the community coming together, our other advocacy partners, and every patient who is part of the project. Your role in supporting the project has been and continues to be instrumental in ensuring that this is driven by patients and advocates in the metastatic breast cancer community. Please accept our sincere gratitude for everything that you are doing to make the project possible. 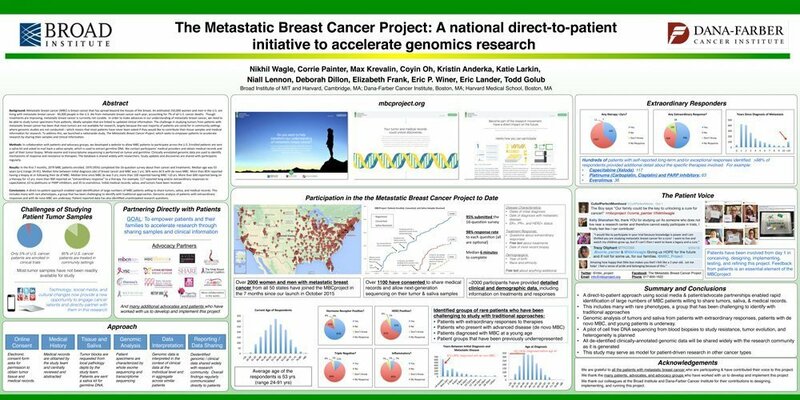 If you are not familiar with the Metastatic Breast Cancer Project please read this overview. Click the image below to view the full-size infographic. The MBCproject.org is a collaborative effort between researchers, doctors and patients launched at the Broad Institute of MIT and Harvard as well as Dana Farber Cancer Institute. 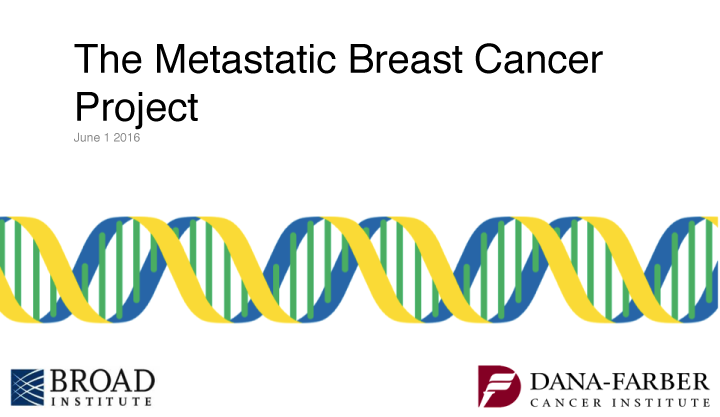 The MBC project is focused solely on metastatic breast cancer. The goal is to generate a comprehensive set of data that will be stripped of personal information and shared with the entire research community so that all scientists can take part in the discoveries made possible by direct patient engagement. To join the project, please press the “Count Me In” button on the website www.mbcproject.org. If you are a stage 4 breast cancer patient, we strongly encourage you to join this project. We also strongly encourage everyone to be a supporter by share this information as widely as possible.